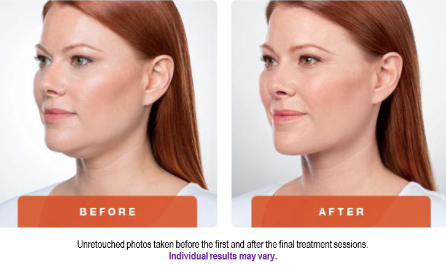 ​Kybella™ is a new injectable treatment for submental fullness (double chin) that can significantly improve chin contouring without the invasiveness and downtime of surgical options. 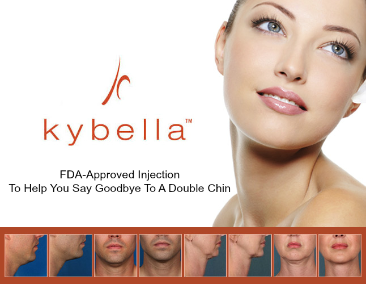 Kybella was approved by the U.S. Food and Drug Administration (FDA) in May 2015 for the reduction of submental fat. ​Kybella is a synthetic formulation of deoxycholic acid, which is a substance naturally synthesized by our body and used to break down and absorb dietary fat. Kybella has been under development for more than 9 years, and has been the subject of over 20 clinical studies involving more than 2600 patients. When properly injected in the chin area, it has been shown to dissolve submental fat (which causes double chin) and result in significant cosmetic improvement by creating a more streamline contour along the jawline. ​Kybella is administered by injections into the fat under the chin through a series of treatments spaced about one month apart. The treatment plan is tailored to the desired outcome by the treating physician. The total number of treatments varies–typically in the range between 2 and 5. We expect that most patients will receive two treatments spaced 1-2 months apart, but your provider will determine the best regime during your consultation based on your physiology and goals. Typically results appear within weeks to months, and keep improving as additional treatments are administered.​ When injected into the fat under your chin, Kybella causes the destruction of fat cells. Once destroyed, those cells cannot store or accumulate fat. After the aesthetic response is achieved, retreatment with Kybella is not expected. Is Kybella safe and what are the side effects? The safety profile of Kybella is well-characterized. Kybella has been the focus of a global clinical development program involving over 20 clinical studies with more than 2,600 patients worldwide. The most common adverse reactions were edema/swelling, hematoma/bruising, pain, numbness, erythema and induration.